More than 3,000 models accompanied by colorful pictures. Select an item, click the price and it will automatically be placed in your shopping cart. 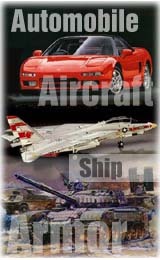 Scale models for sale or scale models wanted -- either way feel free to use our classified service. Cannot find that particular model? Put it on the Wish List. We have specialists who will locate it for you. Join our mailing list so you may receive via email our monthly updates on new releases and hot special items. Information on Hobbyweb, search engine, shopping cart, ordering, shipping, etc . Copyright © 1996 Hobbyweb.com All Rights Reserved.